Barbara Tfank launched her eponymous label in 2001, forging new opulence with a line of beautiful brocade cocktail coats and colorful, classically-shaped dresses. Pairing flattering silhouettes with luxuriant fabrics and fine hand-tailored craftsmanship, she has made herself a notable force in fashion. Tfank's work exudes imagination, creativity, and sophistication. Cut individually and sewn by custom-trained seamstresses, her clothes are the antithesis of mass-manufactured product, her taste and meticulous attention to detail giving each piece artistic appeal. Her clients admire her craftsmanship and consistent fit, while the allure her luxurious textiles attracts the true connoisseur. André Leon Tally said, "Barbara Tfank's collections are conceived like American Couture in incredible fabrics". 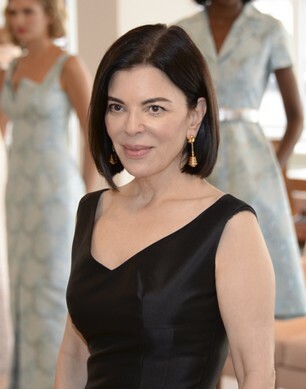 Tfank discovered her love of textiles and tailoring as a design assistant in her native New York City, concurrently honing her skills as a flower designer for the Whitney Museum, the New York Historical Society, the New York City Ballet and the Metropolitan Opera, her love of flowers continuing to inspire her collections. As a well-known stylist featured in Vanity Fair, she worked with renowned photographers Richard Avedon and Bill King, and on highly innovative Japanese TV commercials with luminaries such as Ray Charles and Harrison Ford. Her love of classic American and Italian cinema then prompted a career as a costume designer for feature films, her first movie the acclaimed A Midnight Clear, starring Ethan Hawke. For the trend-setting wardrobe of her next film, Dream Lover, she invited Prada to collaborate, creating an innovative blend of fashion and film. Working as Prada's design consultant the lilac gown she created for Uma Thurman at the 1995 Academy Awards Barbara prompted one of the great Oscar fashion moments, the gown appearing on the front page of Women's Wear Daily's Oscar issue while Hal Rubenstein included it in his book, "100 Unforgettable Dresses". Tfank is also featured in Blue Carreon’s, “Conversations — Up Close and Personal with Icons of Fashion, Interior Design, and Art”. Vogue commissioned Tfank to design a couture dress and coat ensemble for the singer Adele at the 51st Annual Grammy Awards in which the star won Best New Artist and Best Female Pop Vocal Performance. Adele was featured in Vogue's April 09 Issue wearing Tfank, her look becoming iconic as their collaboration continued. In 2011, the singer wore Tfank at the MTV Awards, as she did again at Sony's 2012 Grammy party to celebrate her record-breaking six Grammys. In Spring 2010, First Lady Michelle Obama wore Tfank's delightful floral jacquard pleated dress at the White House to launch the Wounded Warrior Soldier Ride. In September 2011 the First Lady wore Tfank's morning glory dress as she and the President presented the Medal of Honor, the photo of the President and First Lady walking hand in hand featured on Oprah. In May 2011 Mrs. Obama wore Tfank to Buckingham Palace when she and the President met Queen Elizabeth. In January 2012 the First Lady wore Tfank's sapphire silk dress to the State of the Union. Mrs. Obama wore Tfank on the campaign trail, as featured in Vogue, and in October 2014 Tfank was invited by The First Lady to serve as mentor at the first White House Fashion Workshop. Tfank’s workspace there, featuring her whimsical floral designs fashioned into a patchwork tablecloth, was highlighted in Vogue.com. In July 2016, Mrs. Obama wore a white laser cut piqué dress at the final Children’s State Dinner at the White House. Tfank resides in West Hollywood, California with her husband Peter Markham, who heads up the MFA Directing Discipline at The American Film Institute Conservatory. Their historic West Hollywood home was featured in Elle Decor. Barbara received a BA from Skidmore College and an MA from Stanford.